This is a very special day. Not just because this is actually appearing on a Wednesday. It's more to do with the beer: Younger's No. 3. A beer I've a special relationship with. I did once homebrew, when I was young. I started before I was even of legal drinking age. Being broke, there was a big incentive to homebrew. Which, as I recall, was our real motivation. By we, I mean me and my brother Dave. One of our earliest brews was a clone of Younger's No. 3 that had been published in What's Brewing. At the time, it wasn't available commercially. It was during one of several periods when the beer had been discontinued by Scottish and Newcastle. The clone recipe used black malt for colour. It helped hide the malt extract base twang. Overall, one of our better brews. I've since had the commercial version many times. It was always my favourite of Scottish and Newcastle's cask beers. I didn't initially realise the history of No. 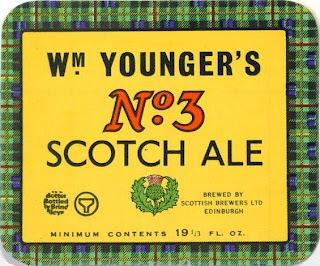 3 and its role in Scottish brewing. I feel privileged to have had it in the wild. Some of you have probably tried No. 3, too. If you have, this recipe might come as a shock. Because if there's one thing that was distinctive about No. 3 it was the colour. A lovely dark brown. Whereas this one is . . . . pale. Scotch Ale. Yes, this is a genuine Scotch Ale. Though it was usually just called Strong Ale in Scotland. Sometime in the 1850's, William Younger overhauled their beer range. introducing loads of new products. Most notable was a range of numbered Ales, from 1 to 4. They seem to have been inspired by the numbered Burton ales of Bass and others. No. 1 was a powerful brew, with a gravity of 1099º. Working down the range, No. 2 was 1088º, No. 3 was 1077º and No. 4 was 1068º. 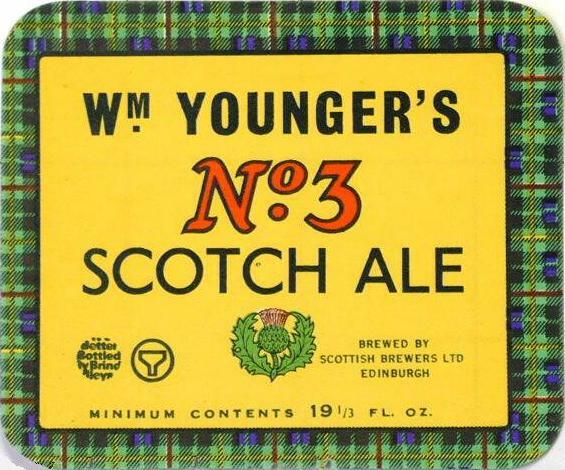 No .1 was marketed in England as Scotch Ale, but could easily have been called a Barley Wine. From the outset, the more moderate-strength No. 3 was the most popular of the four. Continuing through war, crisis and recession, right up to the present day. While the name might have stayed the same, the beer underneath didn't. Like most other Ales (I'm not including Pale Ale in this) it underwent a mysterious change in colour sometime towards the end of the 19th century. And moved from pale to dark. If I've so many Younger's records, why am I so vague about the date? Because, they continued to brew their beers pale, colouring them later as required. How can I be so sure then that these beers were indeed dark in colour? Because of those oh-so-handy Gravity Books, which often give the colour. It was a reasonably common beer in London in the first half of the 20th century, where it took Burton's place in a pub's draught lineup. Like all British beers, the gravity was nibbled away in the 20th century. It fell to about 1053º between the wars. By 1966, it was 1045º and in 1982 1042º. And on that confusing note, it's over to Kristen . . . . . . . .
Another very short explanation. What the Youngers logs have in extraordinary details for their brewing, all of the beers are very very simple. So, on to this awesome double IPA thing. A wee heavy little beastie indeed! Grist – I haven’t used Golden Promise in quite a long time so I decided it was about time. You can absolutely use Maris Otter or really any other wonderful Englishy malt you’d like. I have come to really like two very different types of pale malts. My very favorite is the MFB pale malt. I’ve found that if you had to have one single malt to do really absolutely anything in the realm of beer, this would be more than adequate. Bitter, IPA, Pils, etc. On the other end of the spectrum, my other favorite malt for different reasons (mostly cost and its ability to play second fiddle extremely well) is Great Western pale malt. You’ll find a massive amount of American breweries use it for everything. I think it is very nice and does a great job, just not as good at everything that the MFB pale malt. Hops – This beer, as can be seen, is about 3:1 or 4:1 Czech: English hops. The English ones can really be anything but I’d stay with a low alpha variety for the amount of greenery you need to add in. As for the Czech, I used 100% Saaz. Czech Saaz at that. Pivní Filosof, Evan Rail, Alistair Reece and I had a great conversation just a week or so ago about the ability to make a big hoppy beer using 100% Czech Saaz. This is pretty much that beer. The thought is/was that one can’t do it. You just can’t get that bitterness. This, is entirely untrue. What you will find is that the bitterness is very different. Its much less harsh. Additionally, I find the aroma is much much higher on this beer (all low AA% hop IPAs even) simply due to the fact of the vast amount of hop that goes in. More essential oils and such. If you need another reason to make this beer, do so for that fact. A big, crisp, dry IPA thingy with a butte tonne of low alpha hops. Yeast – I really like the dry Nottingham for this beer. It dries out extremely well. Finishes quick. Its cheap! That being said, use what you like. A yeast cake would be good for those of you that don’t do starters well. Its very important you get enough yeast into this bugger to dry it out. OK Kristen, your teaser for the day is the abbreviation "MFB". What is this? Don't say that, Ron, or Horst Dimbusch will be repeating that as a fact. Once I have got through my Christmas brewing plans, I am looking forward to making these! @thebrewingman MFB is short for Malteries Franco-Belges, a division of the Soufflet Group. They are a French maltster. You seem to be a keen fan of Nottingham. Can I ask what pitch rate you prefer, and how you rehydrate (if at all)? Nottingham is good for somethings, bad for others. Big beers that need to be dry I find its works extremely well. As is the case here. Follow the instructions on their website about its use and you'll be more than fine. I do 'bloom' the yeast with a bit of lukewarm water. Always with any dry yeast.